Fitted with a 24.3 million pixel full-frame sensor, Sony says that the main target for the Alpha a99 DSLT is professional photographers, and those using its previous cameras including the a900, a700 and a77. It is the first camera in the world to use translucent mirror technology with a full-frame sensor. That means that instead of flipping out of the way as it would in a DSLR, the mirror is a fixed, translucent device to enable a proportion of the light to seep through. A new Bionz processor is included, which facilitates fast frame rates of up to 10fps, 14-bit raw output, Full HD video recording and sensitivity up to ISO 25,600. Several other new technologies have made it onto the Sony a99, including a multi-segment optical low pass filter, light concentration technology and photo diode expansion technology. Being a DSLT, the Sony Alpha a99 has an electronic viewfinder (EVF). This is a 2369k dot OLED Tru-Finder device, which offers 100% coverage and includes options such as a focus magnifier. The LCD screen is a 3-way, 921k dot Xtra Fine LCD display that also incorporates white magic technology. 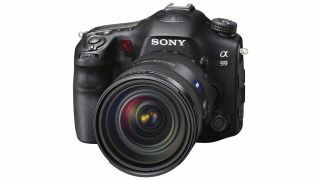 Inside the a99, Sony has combined a 19-point AF system with 11 cross sensors in with a multi-point focal plane phase detection AF sensor that has 102 AF points, that overlays the main image sensor. Sony claims that this unique Dual AF System permits 'ultra-fast, accurate autofocusing that maintains tracking focus even if the subject leaves the 19-point AF frame'. In addition, the Sony Alpha a99 has an advanced AF-D continuous autofocus mode for use when photographing moving subjects. This new mode is supported by the SAL2470Z, SAL2875, SAL50F14, SAL300F28G2, SAL70400G and SAL500F4G lenses, with firmware updates planned to extend lens compatibility. A new AF range control function also enables you to set the AF systems distance range to avoid focusing on near subjects - such as sport stadium lamp posts - that interrupt the view of the subject. Sony claims that the magnesium alloy construction of the Sony Alpha a99 makes it the world's lightest full-frame camera. It also has dust and moisture protection. Dual memory card slots can either take two SD cards, or one SD and one memory stick. There's no sign of Sony using the XQD card that it manufactures for the Nikon D4. Developed in conjunction with Sony's broadcasting experts, Full HD video is available at 60p and 24p. Full manual control is available, along with a headphone jack and a silent multi-controller at the front of the camera. The Sony Alpha 99 price will be around £2,500 (around $4,025) for the body only, with a release date of the beginning of November.